With just 2 weeks left until BAM9, the Smash 4 Senate has decided that it’s time for an update of the national power rankings. It’s been 7 months since v1 was released, and a lot has changed since then, with stellar performances by some of the lower ranked players and the emergences of some new threats. 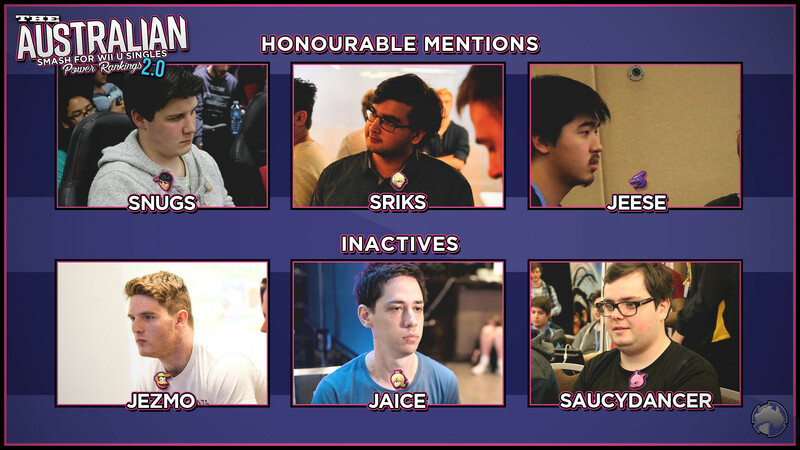 As the global smash community turns its attention to Australia for BAM9, we wanted to take this opportunity to highlight the recent performances of these players. For version 2, we considered results at major events from the past year (starting with BAM8), with particular emphasis on events in the past 6 months (SXC, GvP and EG2). We also considered local events with notable interstate attendance (for example, CW January), as well as local results from 2017. With our last member revealed, we can show you the full PR image! Continue reading for a breakdown of each player. Joshua “Ghost” Francis will surprise very few people in retaining his #1 spot this season. First rising to national prominence with a surprise win at SXC2k15, Ghost picked up Bayonetta on release and has remained the player to beat in Australia for the past 18 months. He has gone through a number of secondaries throughout the past year, but recently has settled with DK as his go-to pick when Bayonetta isn’t working. Ghost started strong this season with a win at EB Expo, taking out Luco and Waveguider. At SXC2k16 in his hometown of Adelaide, Ghost took a surprise upset against Haiku in pools, but nearly recovered with a losers’ run through Poppt1, Quen, the runback on Haiku, and even Extra, before dropping to Jdizzle at 5th place. Although Ghost didn’t travel to the last two major events in NSW, he has still travelled a fair bit recently, making several trips to Melbourne for their monthly tournament series. He has actually attended more tournaments in Victoria than in his hometown this season, and of the five CouchWarriors monthly events he has attended, he has won three of them, placing 2nd and 3rd at the other two. Ghost certainly has a heavy expectation placed on him at any event he attends, and his status as the #1 player has him at the top of many players’ hit lists. Despite this, he has so far lived up to expectations, and is the favourite to take BAM9. Will he manage it, or will a challenger take him out along the way? Nick “Extra” McKenzie is the only player on the PR with a perfect attendance at events in the past year. 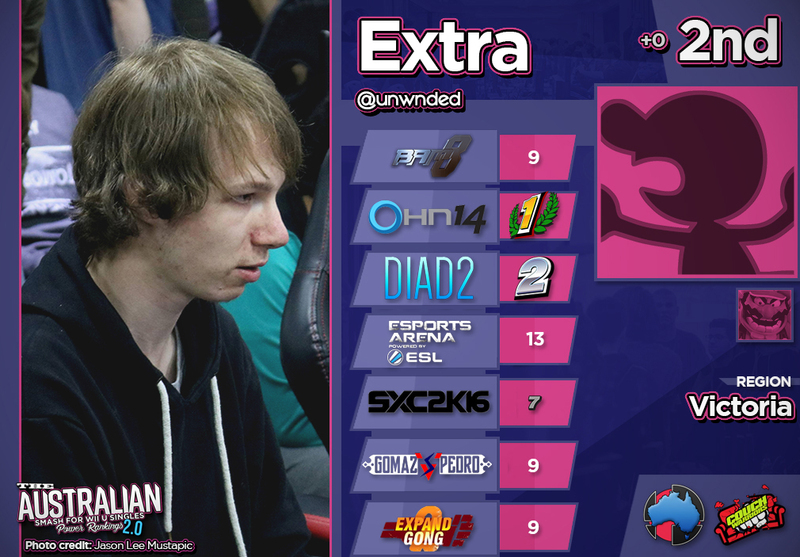 He is ranked 1st on the February Victorian PR, an achievement not to be understated. 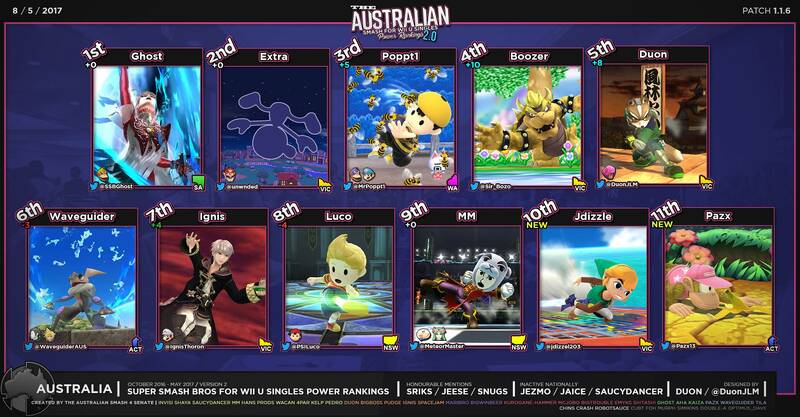 Victoria is widely considered to be the strongest smash scene in the country, and with 5 of the 11 nationally ranked players being from VIC, it’s hard to argue with. Extra’s ability to stay at the top of such a competitive scene is definitely to be desired. Although Extra fell short in the combined bracket of the GvP invitational, he actually won the first seed bracket over Poppt1, who he also defeated at CW January. 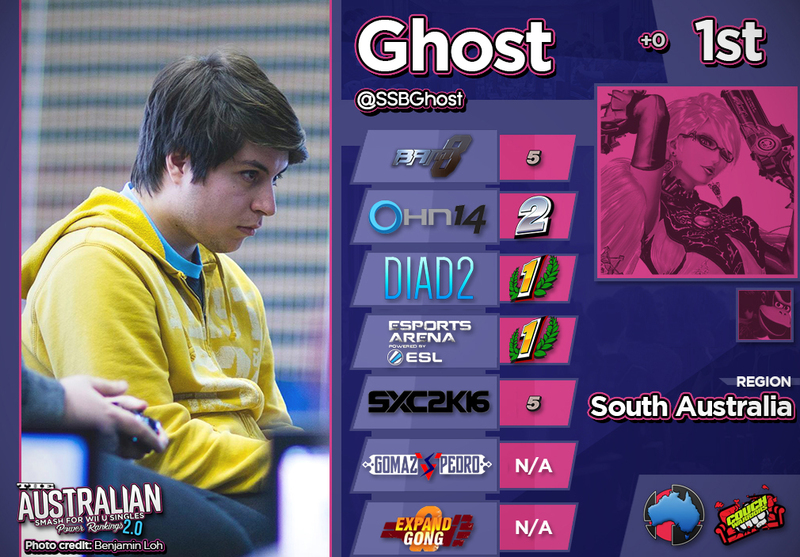 There he also defeated Ghost, continuing a strong record over the #1 ranked player on the AUPRv1. In fact, Extra is the only player in the country with a positive record on Ghost, being 11-8 over him this season. Unfortunately, a recent deterioration of his health and below expected performance at EG2 has left the potential #1 contender clinging tightly to his old rank of 2nd as new challengers emerge below him. Although his very strong performances last year were accounted for to his credit, Extra will need to find new strength this year if he wants to fend off the new blood. Jordan “Poppt1” Ridley doesn’t get the chance to show his face on the national scene all too often, but when he does, he makes it count. He has gone through a number of secondaries throughout the past year; being a Ness main in a scene where the #2 player is a Rosalina main has basically required him to experiment with other characters. Recently, he has been using both Mario and DK to supplement his stellar Ness play. For those unfamiliar with Australia’s geography, the distance between Australia’s east and west coasts is almost as big as it is in the US, but its population is heavily concentrated on the east coast. Poppt1’s home scene of Perth on the west coast is over 2100km (1300 miles) away from its closest neighbouring smash scene in Adelaide. Imagine being the standout best player in a scene of 50 active members near LA and having to travel to Florida to find better competition. This is the travel barrier that Poppt1 faces if he wants to compete nationally. Despite this barrier, Poppt1 has made a number of appearances on the national scene this season. At SXC2k16 his bracket run was cut short when he met Ghost in the losers’ bracket. However, he made his mark at GvP’s invitational event by taking out players including Jezmo and multiple sets over Waveguider to take 1st in the combined bracket and second in the first seeds bracket, losing only to Extra. Not done however, Poppt1 travelled to Melbourne to attend what ended up being the most stacked non-major event this season, CouchWarriors’ January monthly. There he defeated Snugs, Ignis, Jdizzle, and even Ghost to take 2nd place, once again losing only to Extra, though he certainly brought the hype by nearly pulling a reverse 3-0 in GFs after a switch to DK. 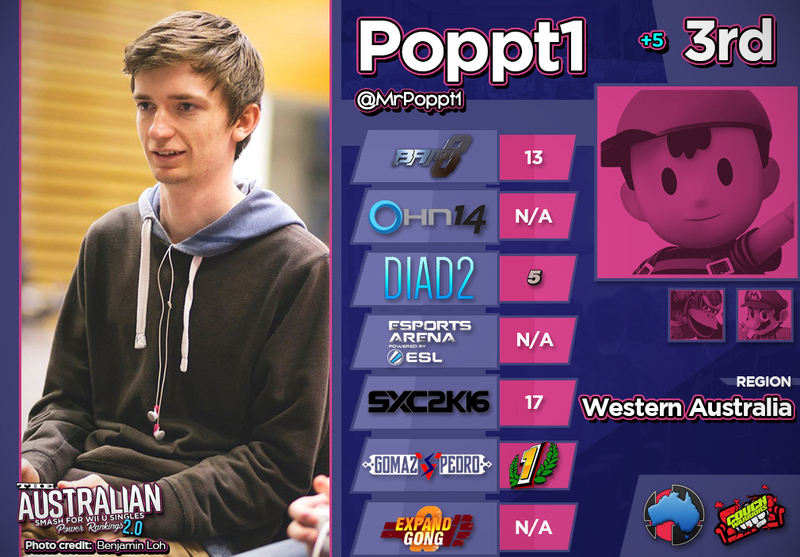 Being the one player that the country looks to to judge the skill of an entire scene is a difficult burden, but so far Poppt1 has represented WA well. Will he be able to continue this at BAM9? Or maybe a lesser known WA player might have their time to shine! Cameron “Boozer” Mackrell has been a national threat since the crucial Bowser buffs in early 2016, and his performance has only been improving since then. At home, he is ranked #3 on the February Victorian PR. But nationally is where he has really made his mark, placing top 3 at every national event he has attended since the release of the AUPRv1. He placed third at both Esports Arena and SXC2K16; just missing out on the major win he wanted. While he placed 1st at Tassie Fighter Con 2, he was not satisfied with his victory and placed 1st again at Wollongong’s premier major event; Expand Gong 2. He took out many names en route to victory such as Ignis, Luco, Duon & MM. 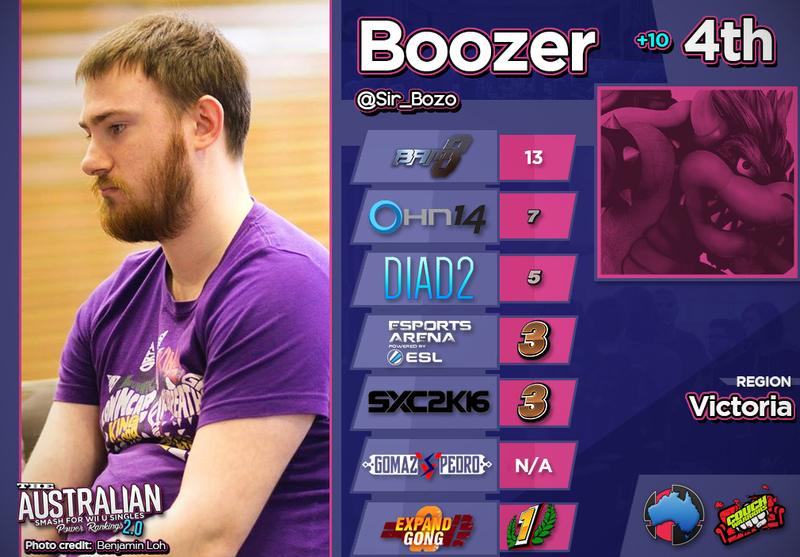 With these results under his belt, it is no surprise to see Boozer jump an incredible 10 spots from his placing on the AUPRv1, and he’s only looking to go up from here. Jason “Duon” Mustapic was a solid Little Mac player ever since he started attending tournaments in May 2015. It wasn't until he swapped to Fox full time that Duon started showing up BIG to tournaments. 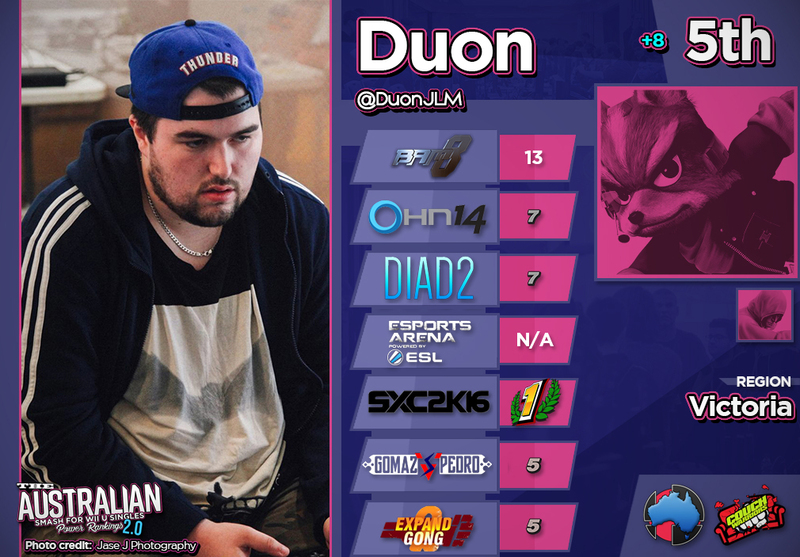 Notching a top 8 placing at every major event he has travelled out of Victoria for, Duon's consistent placements and solid wins list notch him a top five placement on these rankings. He is currently ranked #4 on the Victorian Power Rankings that were released in February and maintains a positive record over Extra & Ignis since that release. Although he had trouble with the local talent in Victoria during late 2016, he was able to pull out a big major win by taking 1st at SXC2K16, beating Haiku, Boozer & Ignis in the process. He took out multiple strong names over the next few months such as Luco, Waveguider & MM as he took out 1st at the second seed singles at GvP and notched 5th at both the GvP main bracket and Expand Gong 2. Alex “Waveguider” Grant is Australia’s longest reigning top player, making a name for himself just a few months after the game’s release. He is also probably the most internationally recognised Australian player - initially known for his Wii Fit Trainer which many considered to be the world’s best, and now also one of the world’s best Greninja players. Thanks to 2GG and the incredible response from the Australian community, make sure to look out for him at Greninja Saga shortly after BAM9! 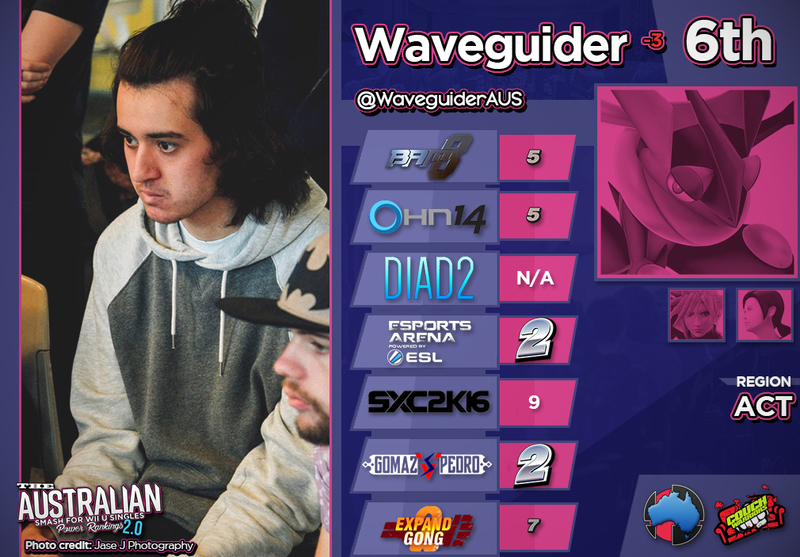 Waveguider is uncontested at home, having been ranked 1st on every single ACT PR to date. Unfortunately, he has fallen from his national top 3 status after having his bracket runs ended by Ignis at both SXC and EG2. Apart from this, he has shown he is still a top player with second placings at both EB Expo (losing only to Ghost) and GvP (losing only to Poppt1 in either bracket). If he can overcome his demons, then he can definitely rise to his former glory. Matthew “Ignis” Allsop is one of the most consistent players in all of Australia. 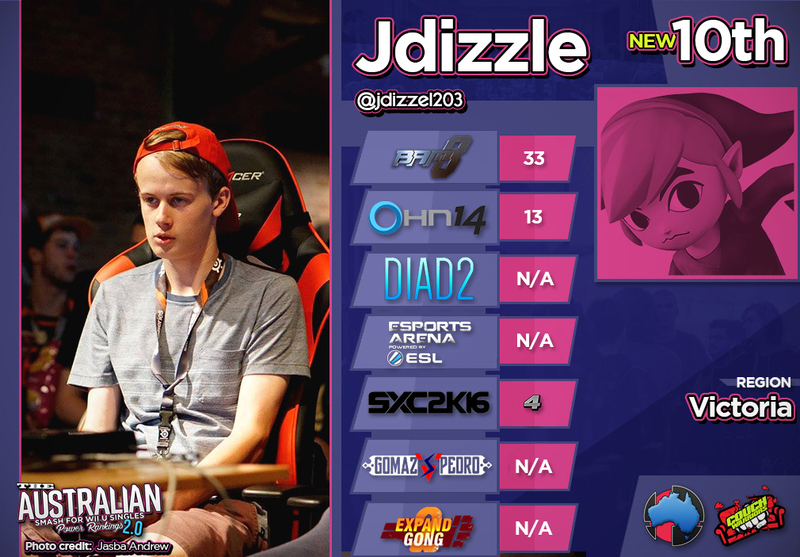 Always finding himself in the upper echelons of Australian smash, he has been taking names ever since the early days of the game's release. Even at his first tournament, Ignis boasted an impressive Mario that showed potential. Now a solid Robin/Mario co-main, Ignis is as strong as ever. Ignis has had an impressive few months, racking up an impressive body count at SXC last year. He finished 2nd while taking out Waveguider, Jdizzle & Boozer in the process. He most recently finished 4th at Expand Gong defeating Jeese, Pazx and once again; Waveguider. 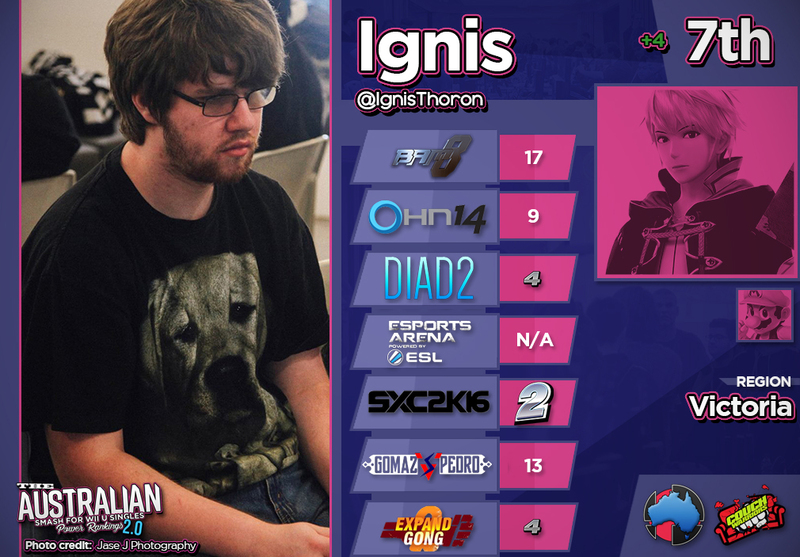 Even in Victoria, Ignis is as consistent as ever, finishing an impressive 2nd at the monthly ranking battle held last month and placing consistently in the top 8 at weeklies. No matter which state he travels to, Ignis will find himself competing with Australia’s best. 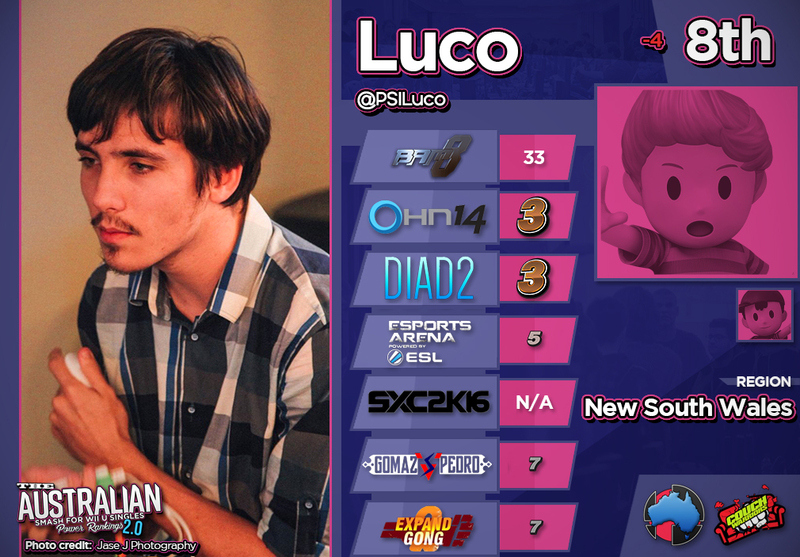 Mungo “Luco” Lennon put his name on the national scene just before v1 of the PR by defeating Ghost at OHN and taking 3rd place at both OHN14 and DIAD2. The global community took note too, recognising him as one of the best Lucas players in the world, with a fearsome Ness that he uses for certain matchups. The expectation put on him was always going to be difficult to live up to, and though he hasn’t quite replicated this level of success at more recent events, Luco is still a very feared national threat. Meeting fellow NSW players in bracket at recent majors has left him with a lack of notable wins over interstate players, but he has still managed to achieve consistent top 8 placings at any major event he attends. He is also very consistent at home; he is ranked #1 on the December NSW PR and has no sign of dropping from there anytime soon. Ricky “MM” Glanville became known as one of the best Palutena players in the world after his performance at BAM8. In the year since, he has gone through a number of different characters and had his ups and downs with his performance. Recently though, he finally found his comfort zone once again, and has proven that he is still a top Australian threat. In addition to his tried and tested Palutena, MM has once again picked up Kount K.K. (or simply “The Kount”), his old secondary from the summer of 2015/16. Kount K.K. is a 1122 Mii Brawler (Australia allows only guest-sized Miis, but they may use any combination of special moves) and is a crowd favourite, with each helicopter kick KO being counted in the style of Count von Count from Sesame Street. 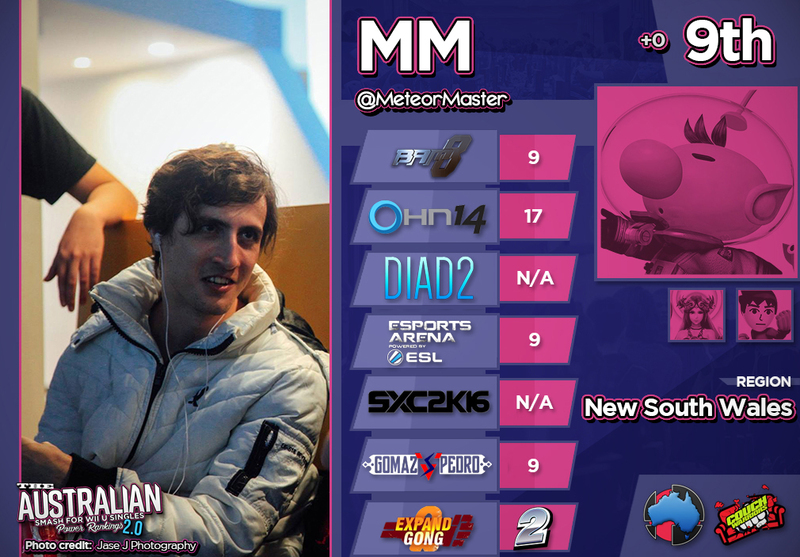 MM has also picked up Olimar to round out a 3 character roster whose versatility serves him well in a variety of matchups. MM has achieved respectable placings at numerous events throughout the past year, including a win on Extra at EB Expo. He also places consistently well at home; he is ranked #2 on the December NSW PR, and his rank is only threatened by jeese. On top of this, his recent performance at EG2 impressed many. He tore through his side of the winners’ bracket and ended ACT’s rampage by beating both Pazx and Sriks, losing only to Boozer for second place. Jonathan “Jdizzle” Douglas is the rising star of Victoria. The Toon Link solo main has been climbing the Victorian power rankings and currently sits at #2 on the February edition. In a region which sported 6 of the 14 members of the AUPRv1, this is no mean feat, and was the main contributing factor to his placing on the national rankings. A long time competitor in Victoria, it wasn’t until June 2016 where he started gaining serious traction. He defeated many big names that month such as Earl, Duon & Extra who were all ranked on the AUPRv1. He continued his slaughter of Victoria as the months went on racking up many victories and placements in a very short period of time. Of course, he would not be here without results on a national scale, which is exactly what he achieved at SXC in December, where he took out Vasi, Ignis and Ghost to place 4th. On top of this, he has a 4-4 record with Ghost over the past 6 months; no one else besides Extra has been able to tackle the #1 rank of the AUPRv1 as consistently as Jdizzle. Pierce “Pazx” Purcell has been an active member of the ACT Smash community since the release of Smash 4, but in the past 6 months he has clearly stepped up his game. 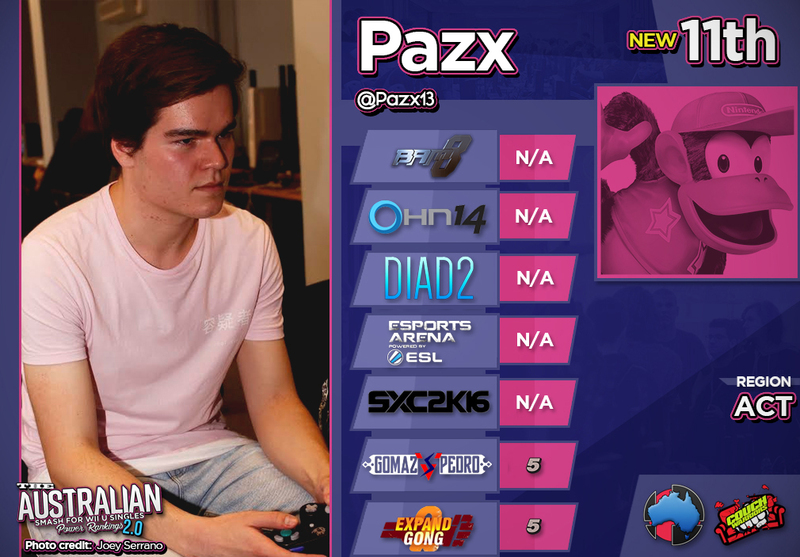 With the absence of Jezmo on the national scene, Pazx is quickly making his claim to be the best Diddy Kong in Australia. Towards the end of last year he travelled to Melbourne where he took out Revax and Duon at a weekly event. Just a few weeks later he travelled to Wollongong’s regional event Final Fight 5, where he defeated two of NSW’s top threats in MM and Kristoph to take 1st place. His consistent placings at home have him at 4th place on the March ACT PR, a placing which he is no doubt looking to improve with his performances in the past month. On top of these local results, his performances at the most recent majors are what earned him his spot on the PR. He placed 5th at both the GvP Invitational and at Expand Gong 2, with wins over SaucyDancer, Luco, Boozer and Extra. Sriks, Snugs and jeese have all had some very notable results recently, and just barely missed the cut for the PR. Nonetheless, we felt these players have all performed at level where they deserved recognition, and have hence given them honourable mentions for the AUPRv2. Srikar “Sriks” Jha was absent for the second half of 2016 due to studying in Singapore, but immediately made his mark on the Canberran scene when he returned in December, and currently sits at 3rd on the ACT PR. He also had a huge breakout performance at Expand Gong 2, making an amazing losers run to place 3rd after falling in his first winners match of the top 48 bracket. Pat “Snugs” Sanders has recently been on the rise in Victoria. He currently sits at 5th on the February Victorian PR, and his performances in the months since have him likely to rise from there. He has also had some good placings at recent majors (placing 9th at both SXC and EG2), but not quite at the level of the players who made the PR. Jesse “jeese” Gong has always been a threat in his local scene since the game was released, ranking top 5 on every NSW PR to date. Despite this, it is only recently that he made a name for himself on the national scene by placing 3rd at the GvP invitational, running through a number of top players in the losers bracket before being double eliminated by Waveguider. While these three players have all been performing very well, we decided that they would need a few more results under their belts to be worthy of placement on a national PR. However, if their current trend continues throughout the rest of 2017, each of these players should have no trouble making the cut for v3. Jezmo, Jaice and SaucyDancer are three strong players who were included on v1 of the national power rankings at 5th, 6th and 12th respectively. However, they were considered to have insufficient data to place on v2. Jesse “Jezmo” Blachut had been inactive for the last quarter of 2016, with the GvP invitational being his first tournament in over 4 months. Despite this, he showed that he is still a top player by placing 4th. He has since attended (and won) a few tournaments in Queensland, but his attendance has not yet returned to the level expected from a top player. Jaice Taylor has not been seen on the national scene since OHN14, but holds an iron grip on the state of Queensland. With the exception of two tournaments where he met Jezmo, Jaice has not lost a single set in over 6 months. However, his complete absence from the national scene over the past 8 months has left us unable to rank him on the PR. Daniel “SaucyDancer” Cronau is still an active member of the smash community and regularly contributes to discussions within the senate. However, in the past 6 months his tournament attendance has been fairly sporadic to the point where he has dropped off his local PR due to insufficient attendance. Despite this, when he does attend he still places as well as ever, including 9th place at the GvP invitational. It is always a shame when top players aren’t able to keep up their smash pursuits, but unfortunately life gets in the way for all of us at some point or another. Despite their limited attendance, we felt that these players were still at a level worth recognising. Hopefully we can see their attendance pick back up (particularly at national events) throughout the remainder of 2017 so that they can make their mark on v3. haha yeah because he has no results at majors whatsoever! !1!